Another line could be 'Power ripped from the Pros'... as the new iPad Air is almost identical to the iPad Pro 10.5, the device launched in 2017, but updated with a couple of internal tweaks and an all-new name - while removing nearly all reference to the iPad Pro 10.5 from its site. Crucially, it's been given a huge price drop as well - meaning Apple has essentially just slashed the price of one of its Pro models and found a way to make it a 'headline' iPad sale for the next couple of years at least. In an era where the 'big new thing' is often massively different for the sake of it, having something that just rebadges the older tech and boosts it where needed is a neat move - both from a cost perspective and environmentally. By shifting the 'Pro' moniker from the iPad Air, it also makes it feel more accessible - the distance between the base-level iPad and the next most-powerful model has closed significantly and could incite more people to spend a little more, especially as there's now the option of the Smart Keyboard too. The iPad Air is Apple's statement that the needs of the 'pro' have moved on, and the spec list it was offering with the Pro 10.5 simply wasn't enough - although still would be desirable for some consumers, so it shaved off a few small specs that the more casual user wouldn't use (because if the iPad is your main weekend camera, you've got a problem) and brought the price down. It's also kept the Lightning connector, as well as the 3.5mm headphone jack... the loss of both of these on the new iPad Pro 11 and iPad Pro 12.9 is one of the most irritating parts of the tablet, and would be sorely missed by the non-pro users. 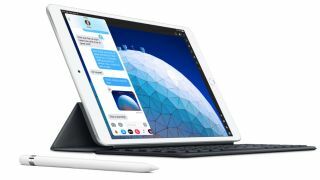 So with the iPad Air, you're now getting almost everything the impressive iPad Pro 10.5 offered for a lot less - and if you need the raw power as well as a top-end screen then the higher-end iPad Pro range still exists for you to sample. However, there were very few rumors that pegged these new iPads to launch today, so spare a thought for anyone that spent hundreds more on a Pro 10.5 in the last month... they're going to be using that superior camera as hard as they can.